Consumer products such as functionalized textiles and wearable electronics that monitor bodily functions during e.g. sports activities are becoming increasingly popular, as is the use of wearable devices in healthcare applications. 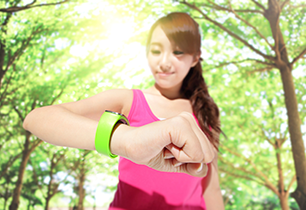 Benefits of wearable electronics are vast: monitoring physical functions enables immediate feedback. Collecting and analyzing large volumes of data provide further opportunities for individual or collective improvement. Specialists are now questioning the risks and impact of releasable metals on health. Where are the health risks involved? The release of ions due to oxidization gives silver its strongly antimicrobial effect, which is why many consumer and health-related products contains nanoparticles of silver. These ions should combat bacteria on the surface of the skin but not be absorbed. Traces of silver from body-worn textiles, electronics – or jewelry, for that matter, may enter the body through the skin, but generally pass through. However, small deposits may build up. Also, contact with perspiration may cause oxidation. Yet, human data on dermal absorption of silver under ‘in use’ scenario are scarce. In recent joint research projects (e.g. NanoNextNL), Philips Innovation Services, Amsterdam’s Academic Medical Centre (AMC) and VU University Medical Centre and the Universities of Trieste and Zagreb examined the extent to which silver nanoparticles might enter the body in ‘real life’ conditions. In both studies, traces of absorbed silver were found, but remained within safe limits, not exceeding the current reference dose. These new insights after skin exposure were recently published [1,2]. However, this doesn’t mean metal-plated consumer or healthcare products are inherently without risk – it simply implies this is the case when silver levels and absorption are closely guarded. Better avoid risk-taking here in view of legal consequences. Philips Innovation Services has access to specific knowledge concerning metals and human biology interaction (e.g. bio-compatibility) as well as advanced technologies for analyzing nanomaterials, such as atomic spectrometry and hyphenated techniques. We can determine the extent to which wearable products’ metal content might affect human health and advise on how to limit this. C. Bianco, S. Kezic, M.J. Visser, O. Pluut, G. Adami, P. Krystek, Pilot study about the determination of silver in skin layers and urine after dermal exposure to a functionalized textile, Talanta, 2015, 136, 23-28. O. Pluut, C. Bianco, I. Jakasa, M.J. Visser, P. Krystek, F. Larese-Filon, T. Rustemeyer, S. Kezic, Percutaneous penetration of silver from a silver containing garment in healthy volunteers and patients with atopic dermatitis, Toxicology Letters, 2015, 235, 116-122.